So this morning I’m sitting at work with a sweet tooth when I remember that the odd confection was still in my bag. I’m always more adventurous at work for some reason. I took just small nibble, you know- just in case. The first thing I noticed is that the bacon is light and crispy and it’s almost like a rice krispies, but it’s much more savory. A perfect combination of sweet and salty (which I happen to love). 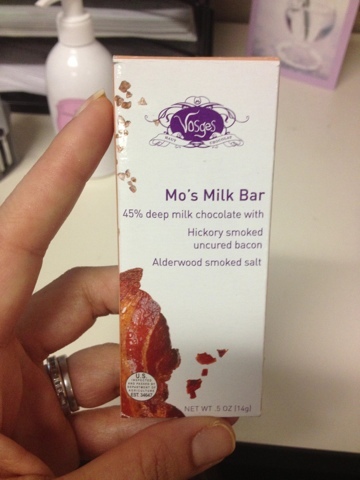 It’s creamy “deep” milk chocolate and hickory smoked uncured bacon and it’s divine. 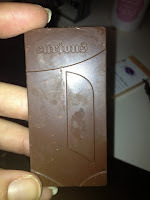 Literally the best chocolate I’ve had in a long time. No regrets here! And in case you were wondering- there are no nitrates or nitrites in the bacon- a little something I look for in my meats.